The weather around here has finally got nice enough to haul the BBQ out of storage and get grilling. As we get into the summer days we barbecue just about everything (amen to less dishes). 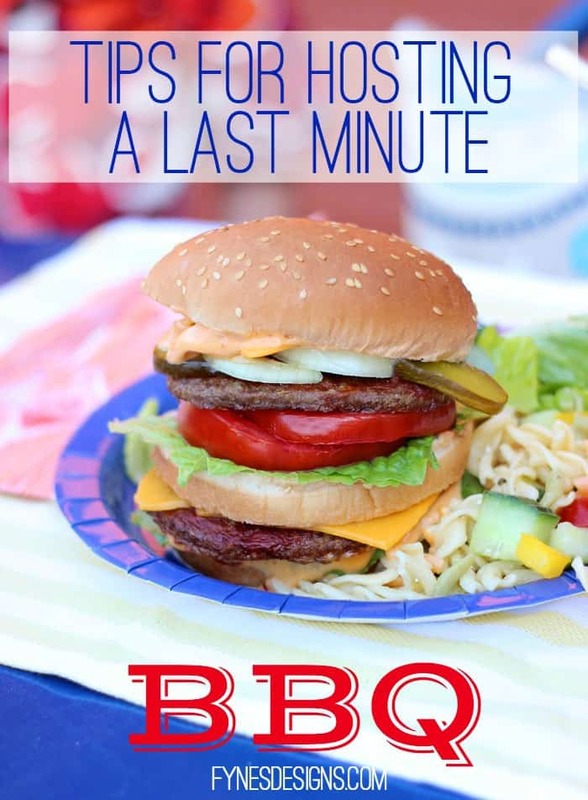 We are no strangers to hosting a last minute BBQ. I love a planned dinner party as much as the next gal, but I love impromptu get-togethers of family and friends too. There is something about running into someone at the beach and saying “why don’t you pop in for a bite to eat, we’d love to have you” the scrounging around the pantry making a combination out of nothing really gets me. 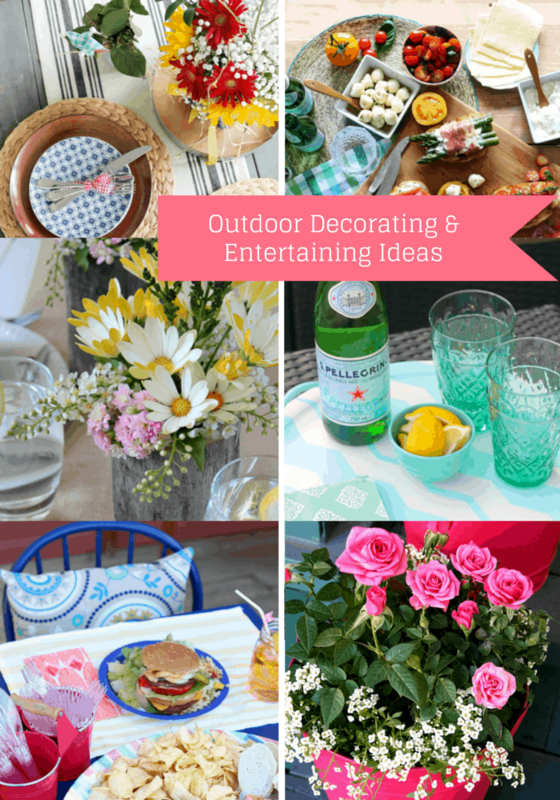 Today’s post is the second week of the Outdoor Extravaganza, last week’s theme was plants and flowers where I shared the Easy to Build Patio Planter and the theme this week is Dining and Entertaining. I never shy to invite someone in. Chances are my house is messy, the kids are dirty and I have 15 totes of last weeks catering dishes piled to the ceiling. But if the weather is nice you’ll probably be outside on the patio, send the kids for a run through the sprinkler, and just avoid the garage (it’s a madhouse from May 1-Jan 1). As nice as it is to have the perfect place setting when you have guests over, barbecue tastes just as good off paper plates. 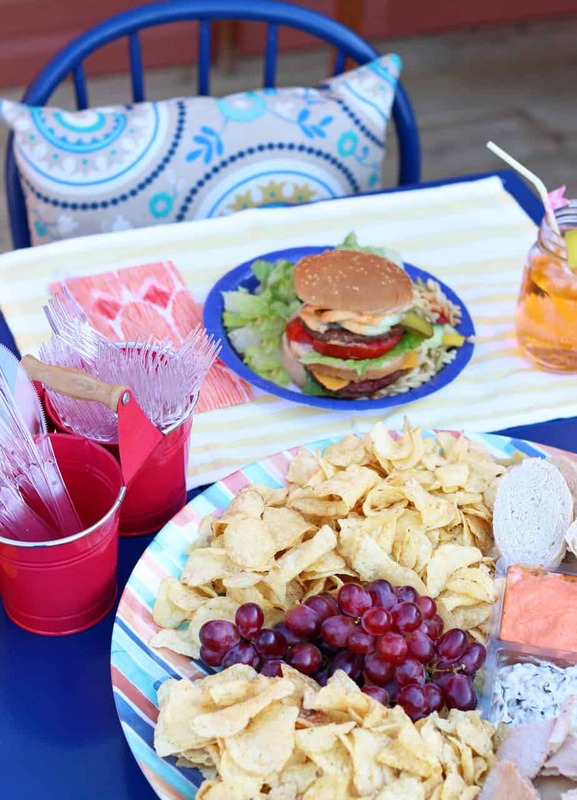 Grilling is supposed to take the stress out of the kitchen so have a set of cute paper plates, plastic cutlery, and pretty napkins on hand, you’re guests won’t mind a bit! Don’t fuss over appetizers. Arrange what you have on a pretty platter and it is sure to disappear. PC® Applewood Smoked Bacon Kettle Cooked Chips are a treat we’ve had in the pantry lately, they are great paired with a dip or solo. Add a in a bit of fruit, a cut up baguette or ripped pita. 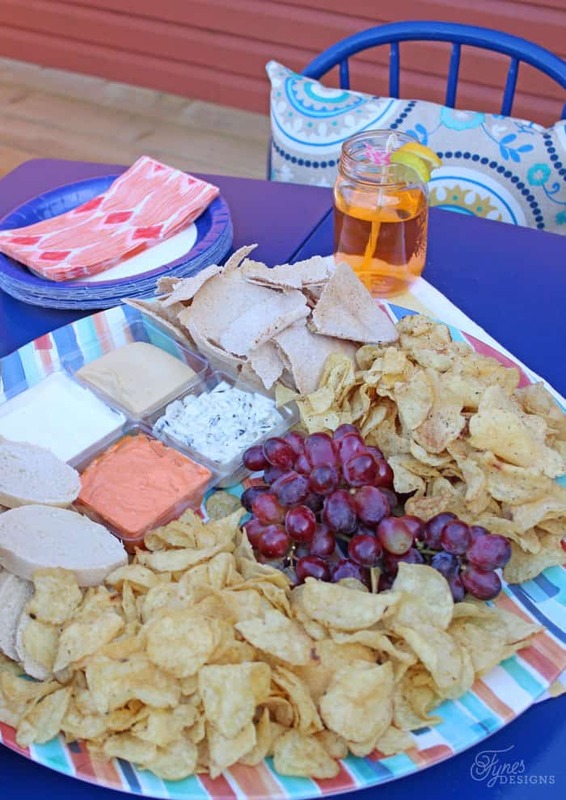 Sliced smoked sausage, cheese, and crackers is another quick go to when you’re whipping up a snack in minutes. If you have extra time you might try this yummy Thai Nacho Dip. Stash a few frozen items in freezer. All you have to do is pull it out and you’re ready to go. 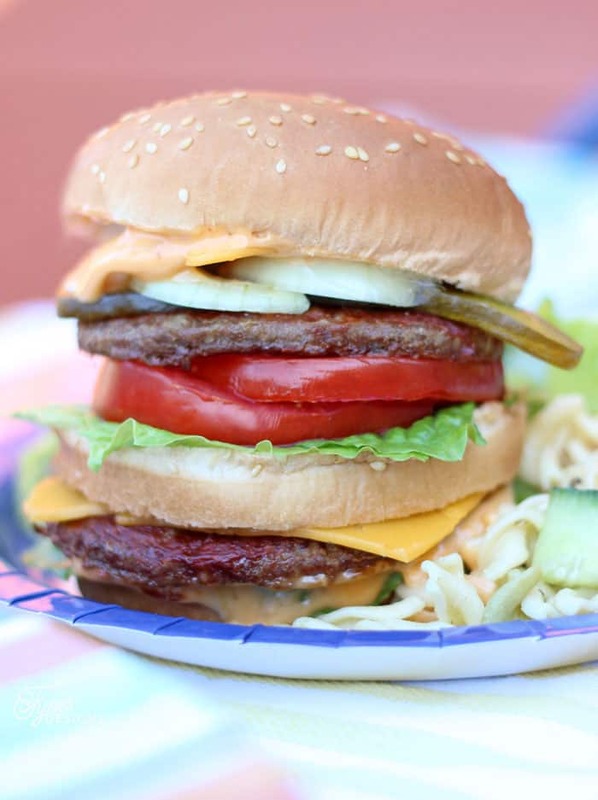 A favourite of ours this year is PC® Double Decker burgers and buns. They are super fun and so delicious. If I’ve learned anything form catering its that people love options. You can offer your guests an assortment of toppings to choose from like tomato, pickles, onions, cheese, hot peppers, and grilled pineapple. Other than K, M, R we like to have PC® Not So Secret Sauce and PC® Smokey Bacon Mayo on hand, that add gourmet flavour to regular burgers without any extra prep. When it comes to drinks, cracking a cold one is always the quickest option to please the men. For the ladies I like to have a bottle of Mr. and Mrs. T drink mix on hand. 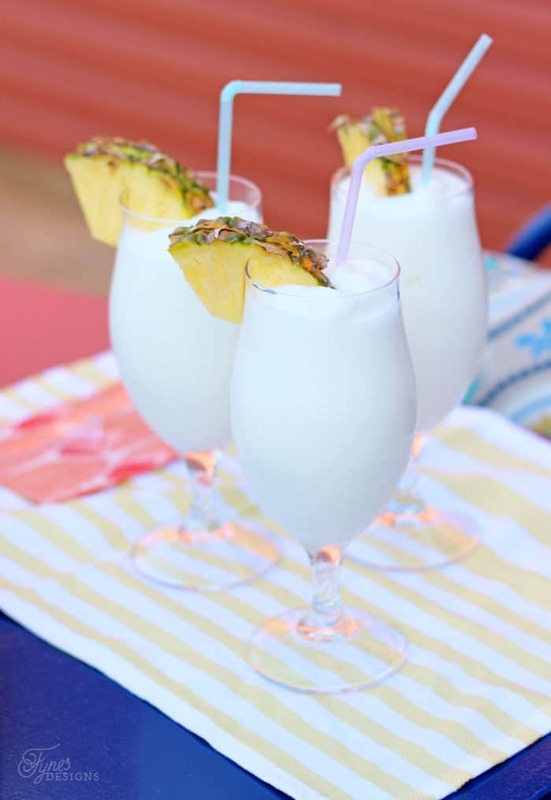 You can whip up a festive drink in seconds with just a blender and a bit of ice. I have a few salad tricks up my sleeve depending on what is in the fridge. The quickest prepared salad is cooked pasta with diced vegetables (like peppers, cucumbers, broccoli) and Italian salad dressing. It will take you about 10 minutes to prepare, and is always a hit with kids. 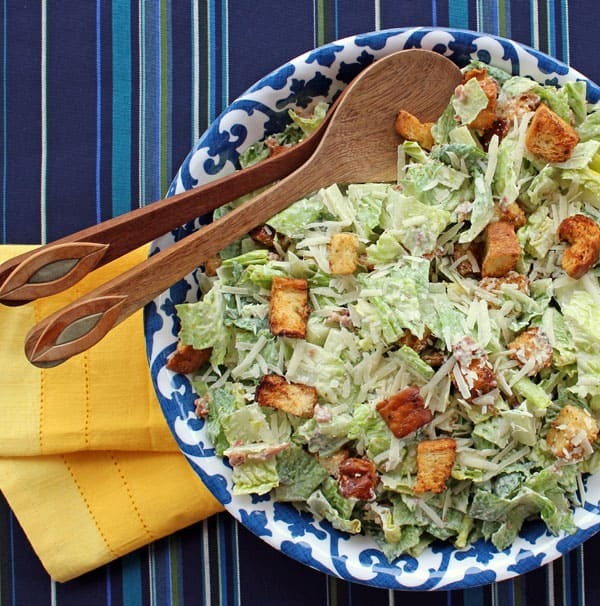 Or whip together a yummy Caesar salad with homemade croutons if you have extra time. The moral of my story is don’t stress over the small stuff when it comes to summer last minute entertaining. Often when catering I’ve found the simplest things are always the crowd pleasers. Spend time with your guests rather than in the kitchen, laugh, drink, play a fun hand of cards, or an oversized yard game– you won’t regret all the fun you’re going to have! With planning like that, you’ll be ready for the crowds descending after reading this post!! I try to have at least a few things on hand for this very reason. Frozen burgers, lots of veggies and ingredients for a quick-made dessert (especially for when my son’s friends pop by). Impromptu parties are usually the most fun, and that’s what summer is all about. Right?